Like any good documentary film does, even if you don’t care who Jack Clement is, you do by the end, and take away from it the important information about the accomplishments in Jack’s life. But since Jack Clement was there during so many important and historic events in the chronology of country music and early rock and roll, and because he claims to have spent over a million dollars making home movies, Shakespeare Was A Big George Jones Fan delivers you so much more; particularly an astounding array of archived footage capturing candid and important moments with some of country music’s biggest stars and most important people. 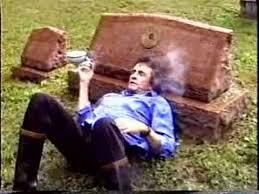 Some examples are Dolly Parton and Porter Wagoner singing together for the first time in 20 years, Johnny Cash, Waylon Jennings, and Townes Van Zandt all hanging out in the same room, and Johnny Cash having a smoke with the Father of Country Music, A.P Carter. And this is all interwoven with other archived and never-seen-before footage like moments from 2 never-released and never-finished Jack Clement TV specials (one with special guests Waylon Jennings and Jessi Coulter), or Charley Pride playing the Astrodome in Houston. And for a little extra character, there are little snippets of Jack Clement talking to a sketch of William Shakespeare (who among other attributes, has the voice of Johnny Cash), that give even more insight into Jack Clement’s creative mettle. But there’s really not one complete, uninterrupted musical performance in the entire hour-long movie. That’s not what this is about. And it’s not even about conveying all the big details of of Jack Clement’s life—his work with Sam Phillips at Sun Studios helping to launch the careers of Jerry Lee Lewis and Johnny Cash, or his launching of Charley Pride and John Prine, or his work with Johnny Cash and Waylon Jennings. It is about capturing the spirit of the man—the whimsy that he approached the creative process with, and how it was his spirit that coaxed out some of the most memorable recordings in country music history from some of its most memorable performers. And though this film was released 8 years ago, it still does a poignant job at the end touching on the mortality that surrounded “Cowboy” Jack in later years, all the way up to his own passing. All his best friends—Sam Phillips, Waylon Jennings, and especially Johnny Cash—had all passed away, leaving Jack behind as the last of the breed. 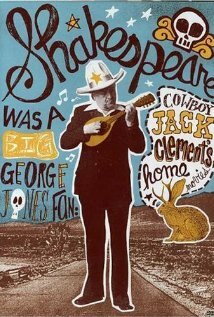 Directed and produced by Robert Gordon and Morgan Neville, Shakespeare Was A Big George Jones Fan is one of the most entertaining, informing, and well-made documentaries on country music you can find, and rose to the challenge of chronicling a character who future generations will unfortunately only be able to know through music and film. Watched this about 2 weeks ago. It shows a side of Cowboy Jack that I didn’t know about. One of the best music documentaries I’ve seen. Brilliant film and great write up ! !